Max file size for Image uploads for inclusion in a post? I have been looking at the images posted and noticed that some are quite large and these (correct me if I am wrong) are added with descriptions of the image and not embedded in the page. Is there an acceptable image file size for posts or any size is ok and is handled by the system ? As you can see, the max file size is 2MiB (which is just about 2MB total). Image dimensions, I don't know if there's such a restriction, you'd have to ask Imgur. But file size limit is 2MB. I don't know if Imgur has a dimensions restriction, but 2MB doesn't leave for much in terms of super 'high resolution' files. As noted in comments, this is only a restriction if using the StackExchange embedded Imgur upload system. 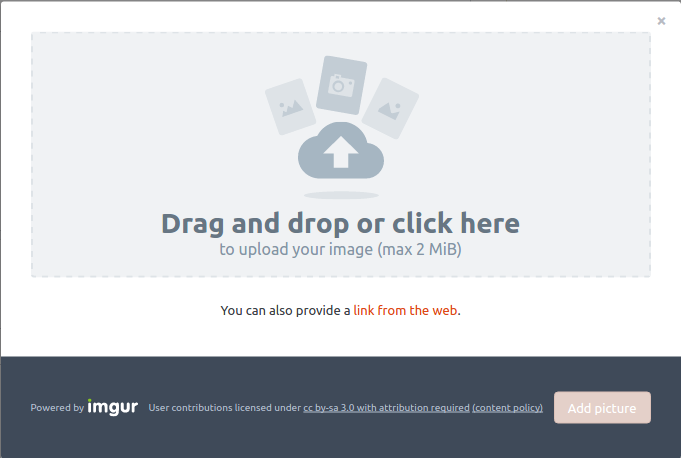 If you upload something to your own imgur account, or run it from your own web server, you are not bound to that 2MB image file size restriction. Is [date] a tag that needs some fixing? What is the recommended way to avoid hotlinking images? Do we really need a tag for each file format extension out there? Can we fix these posts with missing images essential to the answer?